I once visited a Banks Peninsula headland garden whose gardener was in love with Hebes. She claimed to have one in flower for every single week of the year - this impressed me greatly. Since then I've been watching out for books about Hebes. Months later, when Lawrie Metcalf's Hebe book was published, I saw the perfect chance to upskill myself. My knowledge of the lovely New Zealand shrubs called Hebes has been very hit and miss. I enjoy the species that I see in the New Zealand bush, and I grow many different types in my own garden, many anonymous. Lawrie Metcalf's book would give me a chance to get some decent knowledge. Oops! This book is serious! 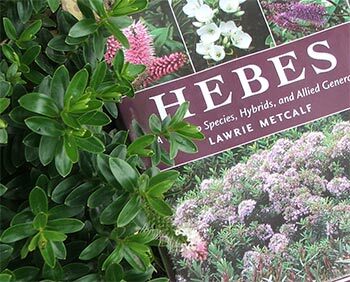 It's titled as follows: Hebes - A Guide to Species, Hybrids, and Allied Genera. The language is horticulturally academic - but even an amateur lady-gardener can afford to learn some new words. I particularly liked reading about the species plants, and where in New Zealand they are naturally found - even naming the exact valley or mountain range. The breeding programmes seemed more than a little more complicated, many garden hybrids having more than one name, and doubtful parentage. I found all my favourite Jack Hobbs Hebes like Wiri Mist mentioned, with glowing reports.